The Louisville Fire & Rescue Pipes and Drums was founded in 1996 with the help of the Kosair Shrine Pipe band. It was made up of mainly Louisville Fire Department active and retired members. The unit was formed in response to the Line of Duty Death of Fire Fighter Sgt Strawn Nutter and the lack of pipers to perform the traditional honors. Now they have expanded further to include other area Fire and Police Departments, and really anyone who wants to learn how to play the Bagpipes and have a good time. The Louisville Fire & Rescue Pipes and Drums unit provides music for parades, ceremonies, memorials, graduations, funerals, weddings and other services throughout the Kentuckiana area. Members of the unit include active and retired members from the Louisville Fire and Rescue, members of Jefferson County fire protection districts, members of volunteer fire departments from surrounding counties and Indiana, Louisville Metro Police, Federal Protective Services, civilian members who have joined the unit as a form of community service, and junior members (i.e. 10 and under). Although the LFRP&D maintains a performance schedule mostly in the Kentuckiana area, the band has had members travel to California, New York, Texas, and various other states to perform for services such as memorials and dedications. Through the years, the Louisville Fire and Rescue Pipes and Drums have built a solid reputation of great performances. The LFRP&D are consistently requested to perform by the Mayors office for various Metro Louisville events and by government officials for events through out Kentucky. The Louisville Fire Department was established June 1, 1858. The men and women of the department have served the community through hard work, dedication, commitment, honor and personal sacrifice. The Louisville Fire & Rescue Pipes and Drums unit was established in 1996. This tartan hopes to be a visual representation of what it means to be a member of the Louisville Fire Department. The colors in the tartan reflect the colors in the everyday uniform worn by the personnel of the department. They are a reminder of what it is to be one of "Louisvilles Bravest". RED is for Courage. The courage to answer the call, not knowing what or when. BLUE is for Honor. The honor to serve our community, our neighbors, our family and friends. WHITE is for Strength. The strength to go into any and all situations. GOLD is for Integrity. The integrity to face each emergency and act for the betterment of our fellow human beings. All of these colors are interwoven into a tartan that shows strength and stability, history and tradition. They are interwoven as are the men and women of the Louisville Fire Department. Together they make a strong foundation for the legacy of the future. "The tradition of bagpipes being played at fire department funerals in the United States goes back over one hundred and fifty years. When the Irish and Scottish immigrated to this country, they brought many of their traditions with them. One of these was the bagpipe, often played at Celtic weddings, funerals and dances. It wasn't until the great potato famine and massive Irish immigration to the East Coast of the United States that the tradition of the pipes really took hold in fire departments. Factories and shops had signs reading "NINA" meaning No Irish Need Apply. The only jobs they could get were the ones no one else wanted -- jobs that were dirty, dangerous or both -- firefighters and police officers. It was not an uncommon event to have several firefighters killed at a working fire. The Irish firefighters funerals were typical of all Irish funerals-the pipes were played. It was somehow okay for a hardened firefighter to cry at the sound of pipes when his dignity would not let him weep for a fallen comrade. Those who have been to funerals when bagpipes play know how haunting and mournful the sound of the pipes can be. Before too long, families and friends of non-Irish firefighters began asking for the piper to play for these fallen heroes. The pipes add a special air and dignity to the solemn occasion. Today, the tradition is universal and not just for the Irish or Scottish. 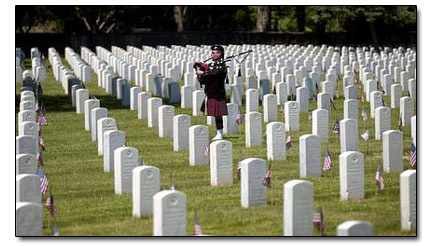 The pipes have come to be a distinguishing feature of a fallen hero's funeral."